Peterborough Sports top scorer Mark Jones. Peterborough Sports can take a giant step towards the Evo Stik Division One Central title tonight (April 2). Sports are at Welwyn Garden City for a fixture that might carry a little extra spice for the league leaders. Welwyn cried off after failing to raise a side for this fixture earlier in the season, but the city side weren’t awarded the points to their obvious dismay. It shouldn’t matter. Welwyn are struggling at the wrong end of the table, whereas Sports are two points clear at the top. That lead will become five points over sole title rivals Brosmgrove Sporting with five games apiece to go with victory tonight and they have a superior goal difference. Stamford manager Graham Drury apolgised to his club’s supporters after a 3-0 home defeat at the hands of Marske on Saturday. The Daniels have little to play for, but they will hope pride will be resorted when play-off chasing Tadcaster Albion visit the Zeeco Stadium this evening (7.45pm kick off). Holbeach United have also struggled for form recently. 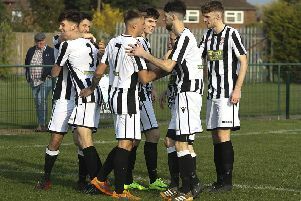 The Tigers are still fifth in the United Counties Premier Division, but would move within a point of fourth-placed Pinchbeck United if they win at Oadby tonight. Deeping Rangers take on Grimsby Borough in the final of the Lincs Senior Trophy at Lincoln United FC tomorrow (April 3, 7.45pm). East Division: Stamford v Tadcaster Albion. Division One Central: Welwyn Garden City v Peterborough Sports. Premier Division: Oadby Town v Holbeach United. Division One North: Downham Town v Wisbech St Mary. Final: Grimsby Borough v Deeping Rangers (7.45pm, Lincoln Utd FC).